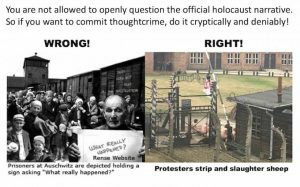 HomeCOMMENTARYDid naked holocaust revisionists symbolically “slaughter sheeple” at Auschwitz? A funny thing happened at Auschwitz the other day. No, Dieudonné didn’t show up to “faire la quenelle” and give an impromptu comedy recital. Nothing quite that funny. Now that is one WEIRD protest. So what in the world were they protesting? The Forward tells us that uncited “reports” suggested it had something to do with Ukraine. But it’s hard to imagine what Ukraine-related message they were trying to send. So let me offer an alternative interpretation. Maybe they were secretly protesting Amazon’s decision to ban and burn hundreds of books that question various aspects of the official holocaust narrative. Maybe the protesters lit a bonfire to symbolize Amazon’s book-burning. Maybe they slaughtered a sheep to symbolize the “slaughter of the sheeple” (the murder of their capacity for free thought). And maybe they stripped off their clothes to symbolize their belief that the “naked truth” about Auschwitz is that it was a work camp, not an extermination camp, and that its only gas chambers were for disinfecting clothes and bedding and killing lice, not humans. Assuming my interpretation is correct, why would the protesters have hidden behind bizarre, opaque symbolism instead of just coming out and saying what they meant? Maybe to avoid arrest, persecution, prison terms, and the destruction of their career prospects? Such things tend to happen to anyone who openly questions the official holocaust story. When free and open debate is forbidden, emotion tends to take its place. Since free speech has been curtailed on so many issues related to Zionism – including holocaust revisionism, false flags, and the power of the international bankers – the pressure that continues to build up around these topics is growing ripe for a massive explosion. If multi-megaton bursts of anti-Jewish feeling ever do finally erupt, the censors, gatekeepers and persecutors will bear a major share of the responsibility. Meanwhile, if you ever decide to stage a public demonstration on one of these forbidden (by the Zionists) topics, you may wish to follow the example of the naked sheep-slaughterers of Auschwitz, and send your message in a cryptic, deniable manner.